Walmart has been getting a lot of credit from me lately for some really smart decisions. Then they do this? I am trying hard to figure out the motivation behind ending Savings Catcher, but it seems so out of touch. Small refunds may seem like they have negligible impact, but for many consumers these represent an opportunity to save for something special for the family on a tight budget. Walmart just killed a great way to engage with customers, with a curt email. The social media sphere is cluttered with people claiming hundreds of dollars in savings. I joined savings catcher about 4.5 years ago, and have received $243.54 in savings, accumulated by $.15 to $1.00 here and there across the years. Not being a huge Walmart shopper, clearly this is not a significant impact on our household budget. However my wife was excited to recently spend our refund on a new kitchen appliance. She felt rewarded. Reading the countless posts on social media its clear to see that many people count on these savings for holidays, birthdays, special events and other things. Its very hard to take things away from people. This is a great example of unintended consequences. In 2014, I was skeptical of it for violating its own every day low price reputation. Now some years later, it tries to sell its customers that the small refunds are not important. Last year, when it changed the process to only supporting Walmart Pay transactions, I saw the first compelling reason to use Walmart Pay for purchases. 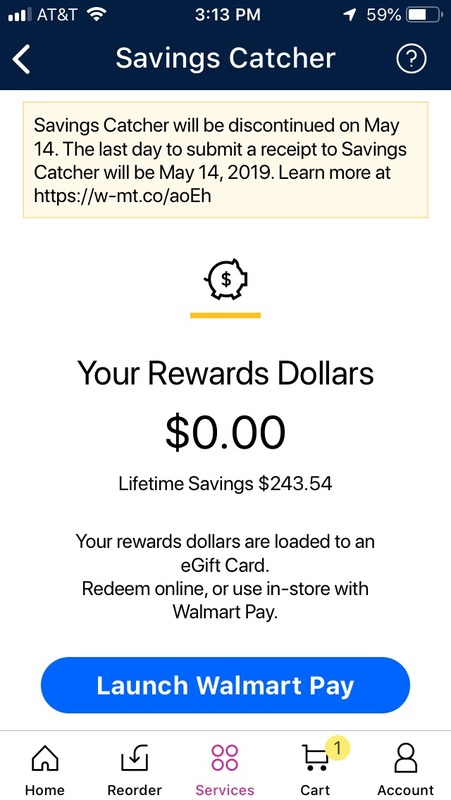 When I read the email from Walmart ending Savings Catcher, my first thought was “Why then would I use Walmart Pay?” The answer is that there really is none. Thoughts on Walmart Drops Savings Catcher, Really? If they really want to compete with Amazon, they have to meet or beat Amazon and this sounds like they don’t get it. I’ve saved almost $300 since joining savings catcher about 4 years ago. Very disappointed they are doing away with it.